Dogs love Cornwall and don't want to miss those Cornish days out. Millie the Cornish dog has set out some dog friendly days out in Cornwall and things to do with dogs in Cornwall - some she is able to recommend and some are still on her list to do. If you can recommend a dog friendly day out in Cornwall or dog friendly place in Cornwall we would love to hear from you. A map showing the locations of Days out with Dogs is at the bottom of the page. Their dedicated and experienced team of vets and nurses aim to make you and your pet feel as relaxed and at home as possible and to offer high quality care and expertise. If you are just visiting they are happy to help if needed and with 5 surgeries around Cornwall including a state of the art hospital in St Columb Major you are never far from a Penmellyn vets. More information about Penmellyn vets Cornwall. Out of the main summer holiday season (when it is very busy) Newquay can be a great place to visit with a dog. Most of the Newquay beaches are dog friendly all year round giving your dog chance to have a good run and play and there are some cliff paths with stunning views (please keep dogs on leads by cliff edges as every year dogs in Cornwall fall to their deaths over cliffs) for enjoyable walks. The walk described here takes you right around Newquay taking in beaches and cliff views. You can follow all the walk or just parts of it depending on how far you would like to walk. A walk around Newquay Cornwall. The Cornish Cyder Farm is definitely on Millie's to do list. It looks such good fun and she has heard that they even serve sausages in their restaurant (where dogs are allowed in the courtyard area), so she is looking forward to visiting for a good sniff round and spot of lunch. Dogs are allowed in all the outside areas on the farm and there are water bowls dotted around for their refreshment. For the rest of the family there are tractor rides, a brand new production factory with aerial viewing walk-way, museum and distillery to have a look round. There are also lots of friendly farm animals to meet, a sampling bar where you can try out some of the delicious cyders and juices which Healey's make and shop stocked well with Cornish goodies. Mowhay's, the restaurant at Healey's, is a great place to relax over a home-cooked meal, cream tea, chilled glass of cyder or simply a hot or cold drink. Dogs are welcome in the courtyard area of the restaurant and so if the weather is fine this is a fun and unique dog friendly place to eat in Cornwall. Healey's has free parking and free entry and so you can stop off for a quick visit or stop all day. The dog friendly beaches of Perranporth, Crantock and Newquay are all all within easy driving reach of Healey's and so you can follow your visit with a good run on the beach. Perfect! Dogs must be on leads at the Cyder Farm. Read more about Healey's Cyder Farm. For those dog lovers who enjoy history then you and your dog can discover Cornwall’s Regimental History on a dog friendly day out at Cornwall’s Regimental Museum. Recognised as probably the finest Military Museum in the South West of England the museum has around 12,000 collection items with over 300 years of military history displayed. There are also Special Events going on throughout the year such as re-enactments and family fun days. The Museum is a dog friendly attraction in Cornwall and so well behaved dogs on leads can go along and enjoy the day out too. (although dog entry maybe restricted at busy times please contact them to check in advance). With 19 acres to explore there is so much to have a look (and a sniff) at. Set in the shadow of an iconic Cornish engine house, Heartlands has brought the former derelict mining landscape at Robinson’s Shaft back to life through extensive renovation and hard work. The result is a free dog friendly attraction in Cornwall which makes a great day out with a dog and really does have something for all the family. There is even a great dog friendly place to eat, The Red River Cafe at Heartlands allows dogs on leads and is good for meals, drinks and snacks. Heartlands also has a full and varied year-round events programme and so there is always something going on with an exciting mix of farmers markets, cultural festivals, art exhibitions and theatre (please check in advance which events are dog friendly and suitable for dogs). Open every day of the year (except Christmas and Boxing Day). Read more about Heartlands. If you are looking for dog friendly things to do in Cornwall then Tanglewood Gardens look like a great place to visit. Well behaved dogs on leads are very welcome at these wild gardens. You and your dog can run, walk or just sit and enjoy the tranquility, peacefulness and wonderful wildlife. All efforts have been made to keep the garden natural with sympathetic planting of native trees and plants, mixed with some exotics. Tanglewood is probably not for those who prefer the more formal, manicured style of garden but if you are looking for dog friendly things to do in Cornwall then Tanglewood provides for a great day out. It is also very family friendly and offers something for every generation. The gardens make an excellent spot for a picnic so pack up some delicious local Cornish goodies and find your idyllic spot. Bodmin moor area is a great place to visit with a dog in Cornwall and offers some beautiful scenery, the chance to get away from the crowds and enjoy the tranquillity and the opportunity for a long or short dog walk depending on your mood. This suggested outing includes two great dog friendly places to eat in Cornwall for those all important refreshments. Start your day with a great breakfast at the dog friendly café the Snail’s Pace Café (seasonal opening) at Wenfordbridge near Bodmin Moor. There is free parking nearby. You can then enjoy a walk along the beautiful Camel Trail. Or, enjoy your walk and then visit the café for a tasty lunch or drink. This unique ‘off grid’ café is set around a recycled shipping container and makes the most of seasonal and ethical options such as their use of free range meat. Tasty sounding vegetarian options and daily specials are always offered as well as cakes, cream teas and a good variety of hot and cold drinks read more. The Camel Trail at Wenfordbridge is a quieter section of the Trail. This first part of the trail follows the river as it comes off Bodmin Moor through quiet woodlands and glorious countryside. An ideal place to explore. The Trail follows the line of the former railroad which carried granite and china clay from quarries to waiting ships in Padstow, and runs some 17 miles from Padstow to Wenford Bridge via Wadebridge & Bodmin. The trail is used as a popular cycle route, by horse riders and by walkers – it is therefore important that dogs are kept under control to avoid accidents and incidents. From here you can drive onto the famous Jamaica Inn (open all year) which is found high up on the wild and beautiful Bodmin Moor and is a dog friendly pub in Cornwall (a doggy treat awaits your dog at the bar on arrival). Bodmin Moor was used as a location in the filming of the recent series of Poldark. The pub serves food all day and so depending on your timing you can enjoy lunch, dinner or light bites or just pop in for a drink. If you telephone in advance they will prepare a picnic for you to take on your walk. Whilst there you can take a look at their fascinating Smugglers’ Museum where tales of wreckers, murderers and villains are brought wonderfully to life and at the Daphne du Maurier memorial room. You may even meet the resident ghost! Before or after your visit to the Inn you can take a walk up to Brown Willey, the highest point in Cornwall (the summit is 1,378 feet above sea level), some 2 ½ miles across Bodmin Moor (the route is available from the Jamaica Inn). Or the Jamaica Inn suggests a basic hike from Codda Ford just north of the Inn up Leskernick Hill and onto Buttern Hill before turning west for Brown Willy. Then over Cornwall's highest peak to return across Catshole Downs. The walk is roughly 6 miles. Or for a more gentle amble head from the Inn to the beautiful Dozmary Pool (which holds the famous Lady of the Lake from the legend of King Arthur and is where Excalibur was thrown) A mere one and a half miles of country lanes and then pathway. Click for more walk details. Please make sure you take advice and check the weather before setting off onto the Moor, if there is any likelihood of rain or mist then postpone your walk for another day (and just relax in the pub), please also make sure you are properly equipped for a walk on the Moor and conditions you may encounter. This day out was kindly recommended to us by one of our doggie viewers Barney who lives in Mylor. Thanks Barney! The charming Mylor Harbour is situated close to Falmouth in Cornwall and can be reached by a beautiful walk from Flushing to Mylor over the stunning Penarrow point, by a water taxi operating between Falmouth and Mylor (weather permitting, throughout the season) which takes in the stunning sights along the Fal River or by car. Set in an area of outstanding beauty for outdoor lovers Mylor has a lots to offer and many nice dog walks in Cornwall to be had. Peaceful days by the Creek, a stroll around the harbour, beautiful walks, stunning scenery, water sports and Mylor Church which is steeped in history to explore. The beach is sheltered and suitable for family days out and picnics. It is possible to hire boats and canoes and to arrange sailing lessons. Mylor beach is a dog friendly beach in Cornwall and so ideal for a days out with dogs in Cornwall. For those essential refreshments Mylor Cafe is a very dog friendly place to eat in Cornwall and even has a Wednesday morning doggie get together where you can meet other dogs and owners, enjoy a hot drink a walk together and then a well earned bowl of soup. Crocadon Farm is situated within Pentillie Estate in St. Mellion, just 20 minutes from the city of Plymouth, on the Devon and Cornwall border. They hold food and craft markets every third Saturday of the month where dogs are welcome, although it may not appear very interesting from a dog's point of view, they do have a dog food seller, K9 Meals on Wheels, who sells healthy and delicious dog food, treats and usually has lots of samples too. They also hold regular Brocantes with lots of stalls offering antiques, vintage and bric-a-brac. Whilst browsing you can also enjoy low key live music, the on site cafe with indoor and outdoor seating in a traditional courtyard where dogs are welcome to accompany their owners. As a bonus they are not far from some great dog walks, such as Cotehele National Trust, Kit Hill and many more. Making it a great place to visit as part of a dog friendly day out in Cornwall. Read more about Crocadon Markets. Gratefully recommended to us by Henry one of our doggy viewers this could be a whole day or couple of hours. Holywell Bay is situated just 5 miles outside Newquay and is a glorious stretch of golden sands which is dog friendly all year and was voted 4th best view in England and No1 for the best beach in England by the National Trust. Above the beach is the Pirans Inn Pub which is a very dog friendly pub for a drink or food or the Treguth a lovely thatched roof pub very quaint, good food and dog friendly both recommended by Henry. The treasure park is a free attraction in Cornwall which allows dogs. You pay for the activities you want to do. It has indoor areas so is good in the rain. The main focus is on a selection of impressive jewellery shops. Running alongside are a build your own bear place, craft shop where you can paint your own things, 'panning for gold or semi precious stones, crazy golf, various other entertainment outlets and jewellery workshops all linked by twisting paths, quiet streams and water wheels. There is also a restaurant with varied menu (dogs are allowed in) where you can enjoy meals, coffee, cakes and Sunday lunch. Events for 2014 Port Eliot Dog Festival to raise funds for the Childrens Hospice SW on 10th May 2014. Located in Cornwall, the Eden Project is one of the UK’s top gardens and eco tourist attractions. They can provide a fun family day out for the whole family, including the dog! The Eden Project is a dog friendly attraction in Cornwall. You can visit their beautiful gardens, with miles of outdoor pathways and good dog walks for your dog to enjoy. There are also dedicated dog friendly facilities, including waste bins, water for dogs, and an undercover dining area where dogs are welcome. Trelissick Park is a beautiful place to walk with a dog in Cornwall and there are marked circular walks, from about 2 to 5 miles, with beautiful views. There is a map near to the parking area and so you can decide which walk or walks to take. Dogs are not allowed into the official National Trust Gardens. There is a gallery exhibiting local arts and crafts in which well behaved clean dogs are sometimes allowed at their discretion and a cafe which does not allow dogs inside but has outside seating (although in my opinion it does not offer good value for the prices charged). Free entrance for National Trust members, otherwise you pay to park. Lappa Valley Steam Railway is a dog friendly attraction in Cornwall and welcomes well behaved dogs on leads throughout the site including the cafe and trains (charges may apply). Set in the Lappa Valley this looks a fun place to visit and is on Millie’s to do list. There are three separate miniature railways, protected areas where wildlife thrives, boating lake, maze, crazy golf, play areas, woodland walks and nature trials and 9 hole golf course. The Cornish Seal Sanctuary is a dog friendly attraction in Cornwall and allows dogs on a lead. Set in the pretty village of Gweek Cornwall in the picturesque Helford Estuary, the Gweek Seal Sanctuary is a great place to visit, giving the opportunity to see the seals and other animals up close. Excellent for children with a quiz trail running through the sanctuary. The original purpose of the Seal Sanctuary was to rescue seals particularly those found in need around Cornwall. They still do this and rescue, rehabilitation, and release many seals each year. Some seals can’t be released and stay on at the centre where they can be seen as well as grey and common seals they also have Fur Seals, Californian & Patagonian Sea Lions as well as otters, penguins, sheep, ponies and goats. Trebah Gardens could make a great day out with a dog in Cornwall, especially for garden lovers. 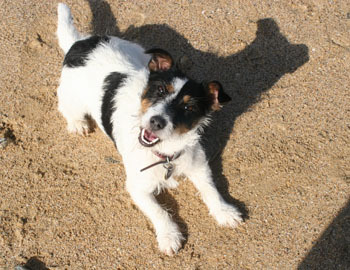 They are a dog friendly attraction in Cornwall allowing dogs on leads throughout the gardens. The fantastic gardens are rated among the 80 finest gardens in the world and present a sub-tropical paradise with a stunning coastal backdrop. They even have their own secluded beach on the Helford River with views out to the Cornish sea. In Spring you can see Rhododendrons, Magnolias and Camellias, Summer Giant Gunnera, Autumn Hydrangea Valley and in Winter spectacular trees. Great for a dog walk. We have never visited but this looks a good place to visit if you have children with you. Holywell Bay Fun Park is a dog friendly attraction in Cornwall and dogs are allowed all over the park except inside the Diner - but there is seating outside. As far as I know they are allowed in Woody's (a cafe) inside and out. You pay for the things you want to do as you go along. Entry and parking is free. They have F1 Go Karts & 2 Seater Star Cars,Thunder Racing, 18 hole Pitch & Putt, shooting range, sand and digger pits, bouncy castles, panning for gold to name a few things. Wheal Martyn Museum is a dog friendly attraction in Cornwall and could make a different day out with your dog. It is The UK's only China Clay Museum. You can find out more about Cornwall’s rich China Clay heritage in the indoor interactive visitor, explore the 26 acre Country Park with woodland walks, nature trials, children’s play area and adventure course. See a modern China Clay pit at work with monitor jets and giant machinery. They also have Cornwall’s largest working water wheel and good access to Clay Trails cycle route. This could be a good day out with your dog in Cornwall. For a magical day out in Cornwall which is dog friendly, visit Tintagel Castle. Set high on the rugged North Cornwall coast, Tintagel Castle offers dramatic views, fascinating ruins and beach cafe making it a perfect day trip, ideal for those on holiday in Cornwall. Tintagel Castle is steeped in legend and mystery; said to be the birthplace of King Arthur, you can still visit the nearby Merlin's Cave. The castle also features in the tale of Tristan and Isolde. With a history stretching as far back as the Romans, Tintagel Castle is one of the most iconic visitor attractions in the south west. Dogs welcome on leads. This Iron Age settlement was originally occupied almost 2,000 years ago. The village consisted of stone-walled homesteads known as 'courtyard houses', found only on the Land's End peninsula and the Isles of Scilly. The houses line a 'village street', and each had an open central courtyard surrounded by a number of thatched rooms. There are also the remains of an enigmatic 'fogou' underground passage. Dogs are welcome on leads. St Mawes Castle is among the best-preserved of Henry VIII's coastal artillery fortresses, and the most elaborately decorated of them all. One of the chain of forts built between 1539 and 1545 to counter an invasion threat from Catholic France and Spain, it guarded the important anchorage of Carrick Roads, sharing the task with Pendennis Castle on the other side of the Fal estuary. It is still bedecked with carved Latin inscriptions in praise of King's Henry VIII and his son Edward VI. Easily falling to a landward attack by Civil War Parliamentarian forces in 1646, it remained neglected until partial re-arming during the 19th and early 20th centuries. Dogs welcome on leads. Pendennis Castle, Falmouth, is one of the finest of the mighty fortresses built by Henry VIII to defend the country against invasion and is a dog friendly attraction in Cornwall. The castle has seen action in many conflicts and was one of the last royalist strongholds to fall during the English Civil War.You can witness a Tudor gun deck in action here and see how the Guardhouse was equipped during the First World War. This award-winning visitor attraction in the south west also boasts an exciting interactive exhibition where you can experience the sights and sounds of battle and relive an enemy attack on a Second World War observation post. Dogs welcome on leads. Carboots – in the summer months – Carboots can be something different to do and a chance to pick up a bargain or holiday souvenir. Cornwall has a number of carboots, mainly in the summer months and dogs are allowed to a lot of them. Check with the organiser before you go for an up to date answer on if their carboot is dog friendly. To read more about Cornish art and see a list of galleries in Cornwall including descriptions see our ART IN CORNWALL SECTION. View our GUIDE TO PLACES IN CORNWALL To help find the ideal holiday destination in Cornwall for you. View our photo gallery to see images of Cornwall and get ideas of where to visit in Cornwall IMAGES OF CORNWALL. When the dog ban restrictions are not in place on the cornish beaches most of the beaches will allow dogs. View our list of cornish beaches for ideas of where to visit with your dog during these times.